Happy (belated) New Year’s! 2019 came by in a whirlwind and I still feel as though 2018 hasn’t fully left us yet. However, when a new year comes, this means a new chapter. 365 days. 365 new blessings and chances to take. 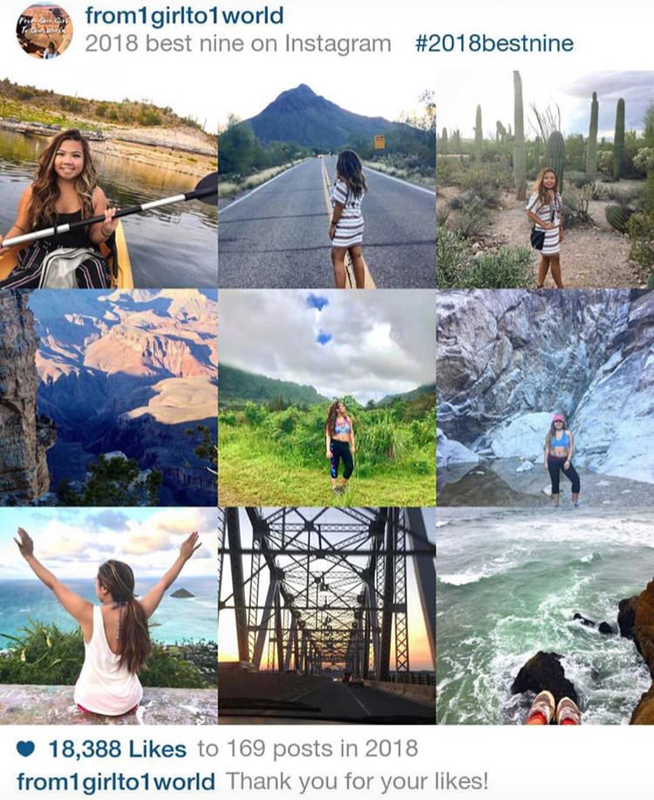 365 (okay, maybe not literally) adventures to do. I have to say that 2018 was one hell of a year. There were so many things to look back on from the things I’ve accomplished to just how different things were a year ago. For New Year’s Eve, I spent my first NYE outside of New York and New Jersey for once and into my new home state, Arizona. Maybe next year, it should be spent abroad… hmm. 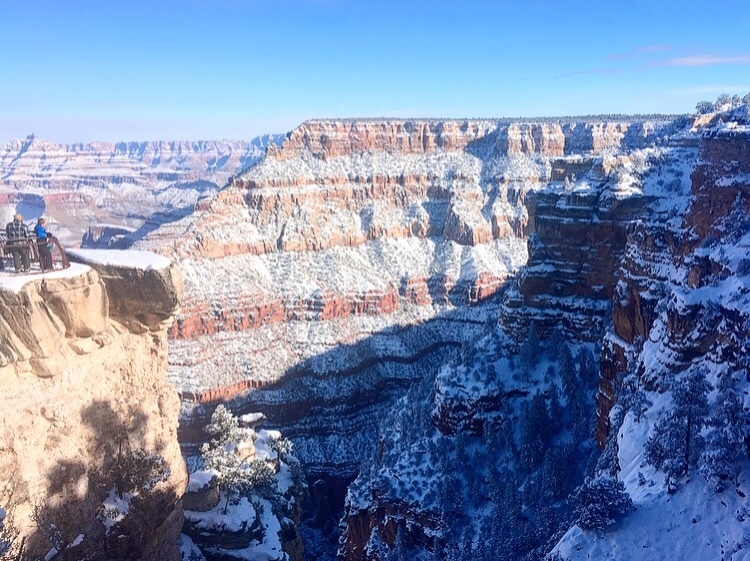 My family, friend, and I all took a road trip up to Flagstaff and the Grand Canyon, which I will get to in a little. Here are some of the main highlights and downfalls of my year in 2018! After trying to desperately find an internship in my senior year of college, I landed a Marketing Coordinator position in a mortgage broker company in New Jersey and had the pleasure to work for them for a whole year. I gained plenty of experience in marketing from it from executing projects with the team, brainstorming campaigns, maintaining relationships with the clients and the company, and to even doing public relations. I have never broken a bone before this but I fractured my spine after falling and slipping off wooden stairs in front of my old rental home that had black ice on it and I hit my back directly on there. 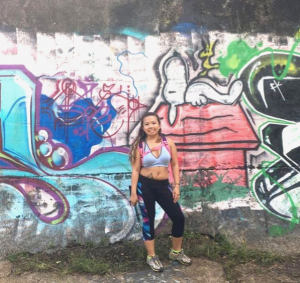 It was one of the most physically painful things I had to experience but luckily, it healed in a couple months and I am now able to do the things I enjoy doing all over again: hiking, kayaking/canoeing, running, lifting things up, and sleeping comfortably. I moved out for the first time on my own in November 2018! Although, not completely alone as I had roommates. However, it was the first time I lived in a place without living with my parents in the same roof. It was something I had to do since I needed to finish college in Rutgers University in New Jersey while my parents moved out here to Arizona, which leads me to where I am now. I experienced a break up with one of my longest term relationships and although it hurt back then going through it, it was actually quite a blessing. The relationship was wrong in so many ways and I didn’t feel like it helped me with any growth. I felt stuck. I am now happily single and learning to love myself day by day before I am ready again to get back out there with dating. 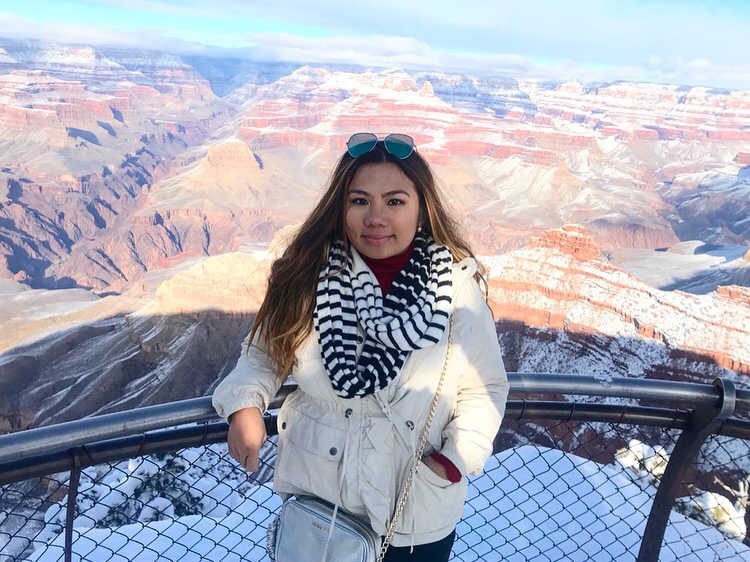 I became really into national parks and with the opportunity to travel back and forth to Arizona for the past year to visit my parents, we took many road trips with each other. 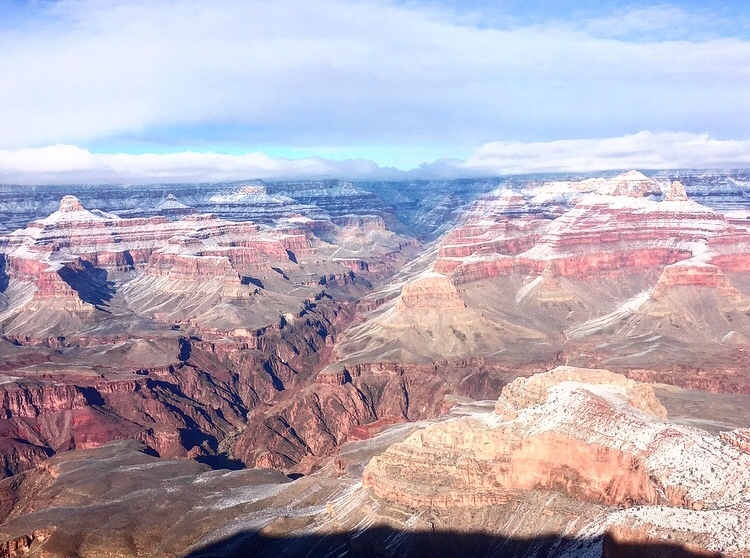 I was able to go visit 7 national parks (yes, while some in college) in 4 different states. It is easily one of the best things I’ve done in the year. Going back to how I moved out for the first time… I did not just move once but 3 times. I moved to two different houses near my college campus and then recently moved here to Arizona. 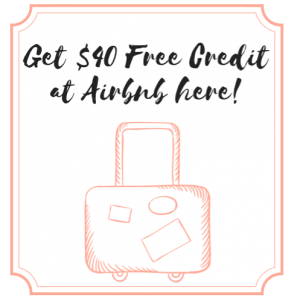 All these experiences prepared me to live more minimally and live with less than when my family still lived in New Jersey. I finally graduated from college with my bachelor’s! Attending Rutgers University (for 1.5 years) went by so fast but college was truly fun and a worthy experience. It took me a while to get there especially as I attended community college before transferring and had to skip a whole semester once because of not knowing which 4-year school I was going to attend. I had thought how I wanted to rush into school by seeing some of my friends graduate before me but now I don’t feel that anyone should. I miss college! And last but not least since this is getting a bit lengthy, I moved across country (as you all already know). It feels scary starting new in a new city and state but I know that things happened the way it should. I really can’t wait to see what living in a new state has to offer me (besides all these awesome adventures and places I’ve been exploring for the past weeks). What a hectic year! There are so many other things I can probably cover but those were some of the biggest things that happened. When New Year’s Eve rolled around, one of my best friends, Leslie, actually came out to visit me here in Arizona and it was just the perfect timing. 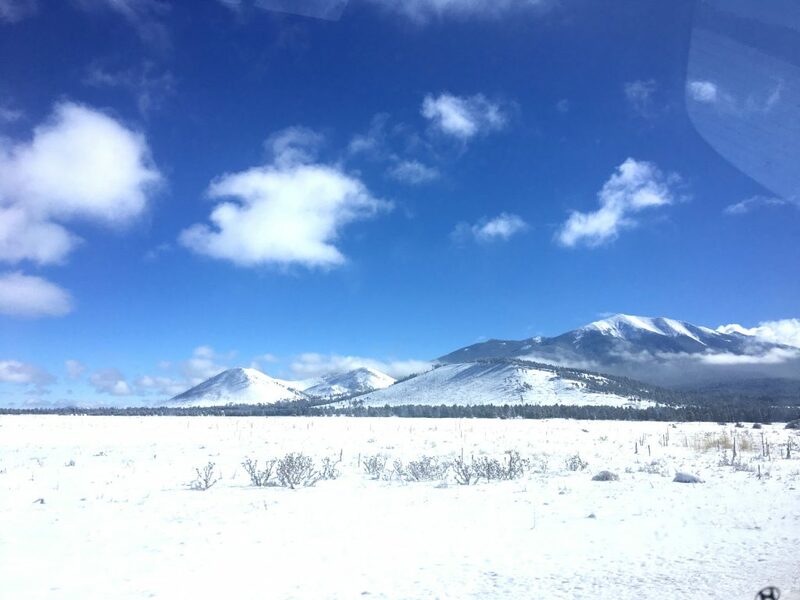 We got to go on a road trip with my parents up to Flagstaff and the way over there was stunning since I got to see the scenic drives to Northern Arizona with SNOW! 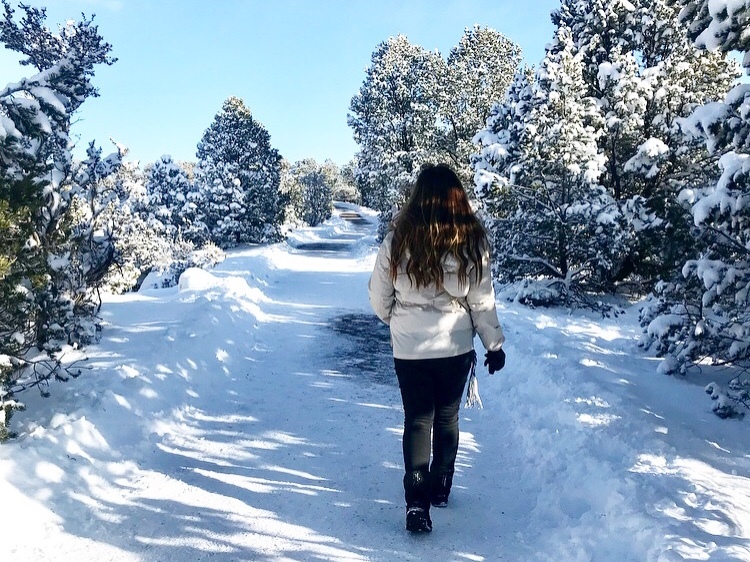 Yes, it snows in Arizona. Not often but when it does happen, it’s one of the most beautiful sights to see. 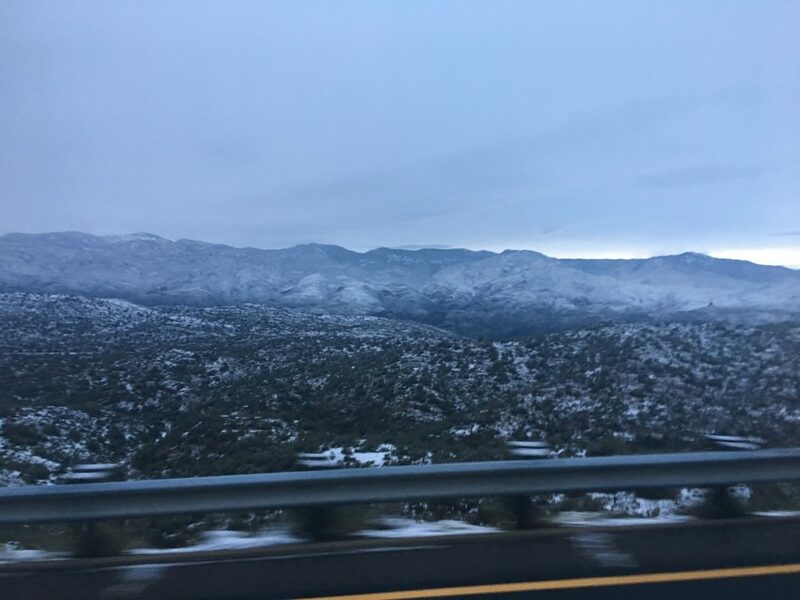 We passed by Black Canyon City and Mayer, which I am used to seeing as we drive through the highways there often for road trips, and seeing it with snow was truly an incredible experience to witness. When we arrived at Flagstaff at night, we had dinner at a Chinese restaurant, just a few short hours before the New Year’s. 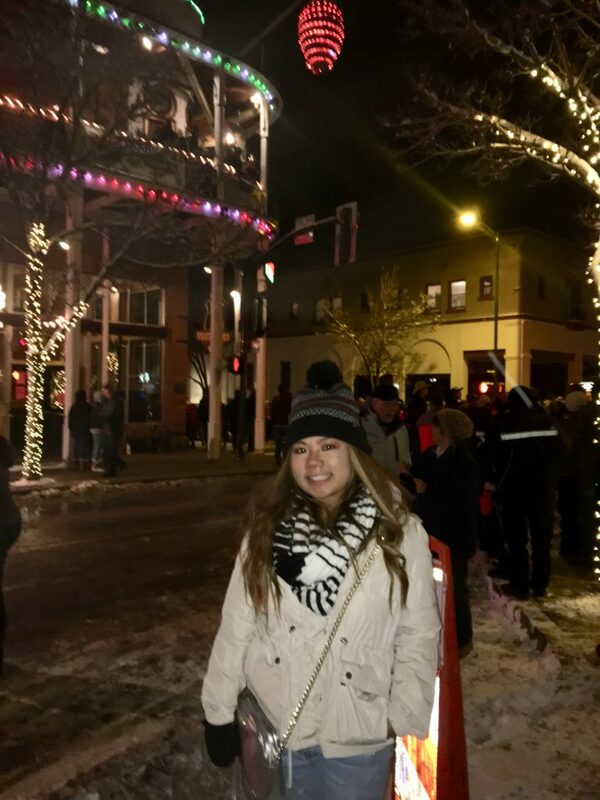 We checked into our hotel room, left our bags there, and then we drove to Downtown Flagstaff. 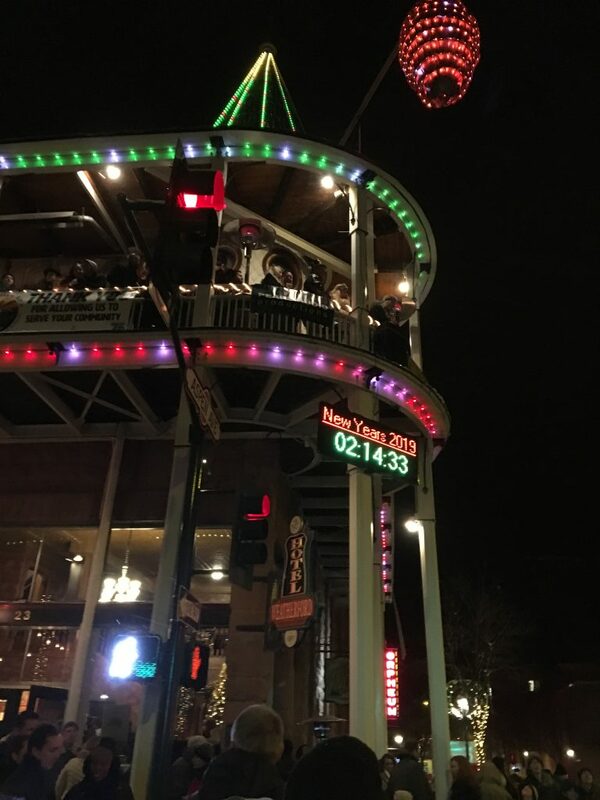 In Downtown Flagstaff, which I have been planning for many months now, there is a quirky thing they do for New Year’s and it is the pine cone drop. 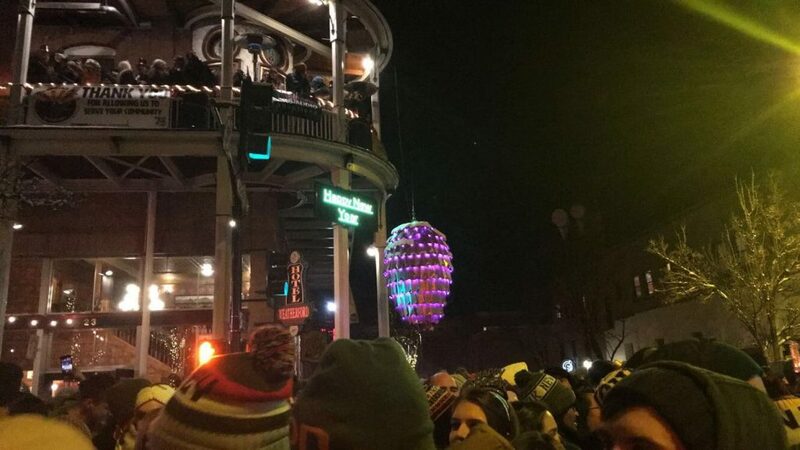 According to CNN.com, it is considered one of America’s quirkiest drops for the New Year’s celebration. The pine cone is 6 ft tall and made of aluminum and it hangs on the corner of the Weatherford Hotel. Another cool thing about this? 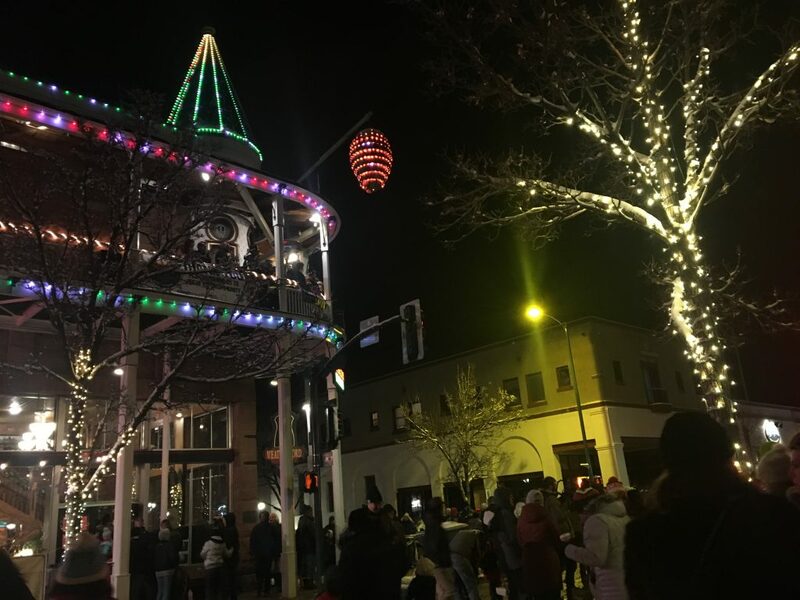 The pine cone drop happened twice, one to align with the East Coast Time and another for the Mountain Time/Arizona. 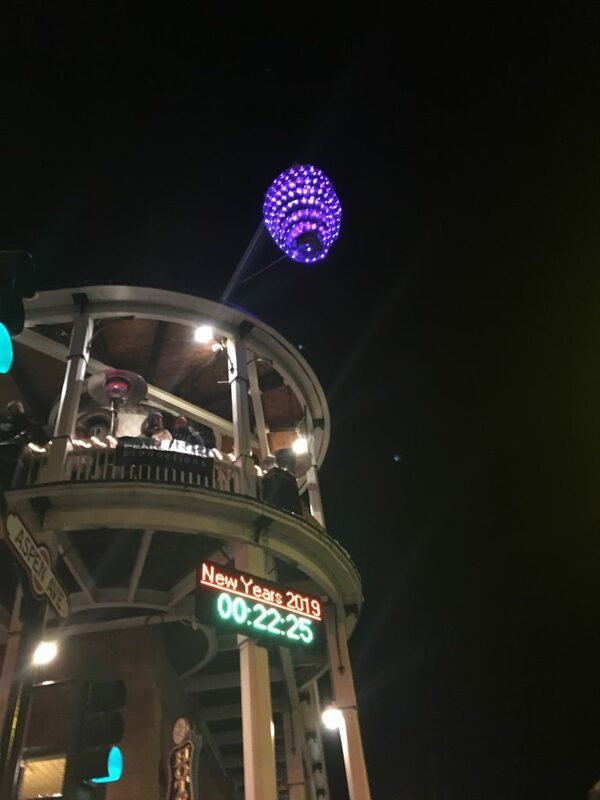 We were lucky to experience the pine cone drop twice!!! Although, it kind of felt like deja vu but since I came from the East Coast, it was only right to celebrate for my friends and family out there. It was such a unique and lovely way to celebrate New Year’s Eve. 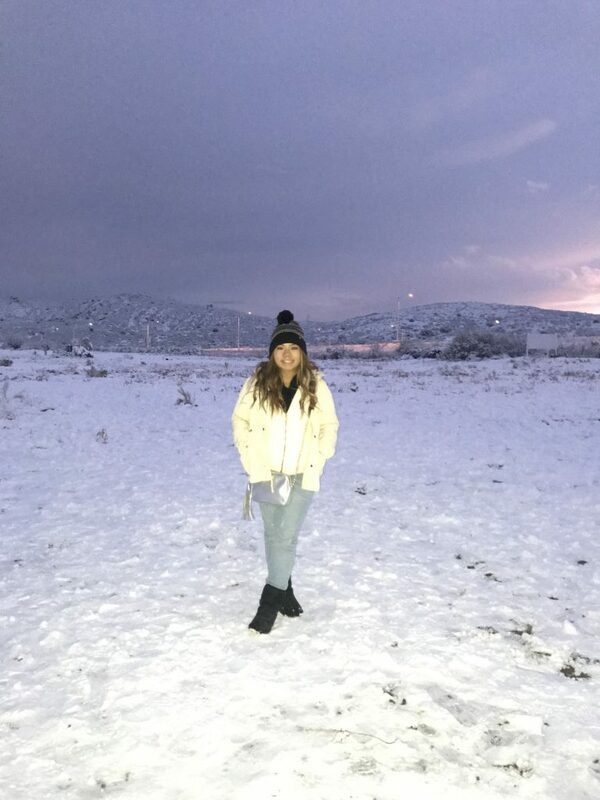 It was snowing during the time too and although it was freezing, I would not celebrate 2019 any other way. For years, I have been spending New Year’s Eve at clubs and bars and this had to be my favorite way of celebrating (so far) since it took outside and it was different yet memorable. 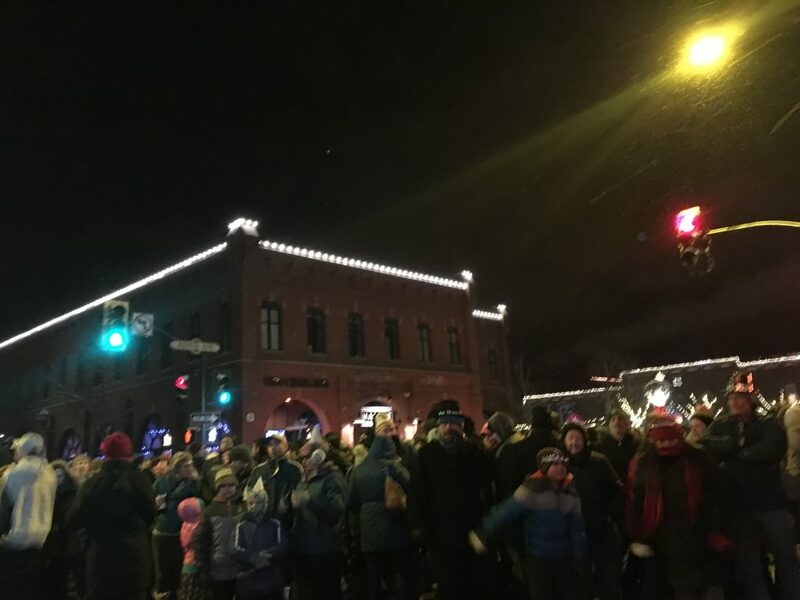 It was also very lively as the crowds came in a lot especially when the 2nd pine cone drop was going to occur. 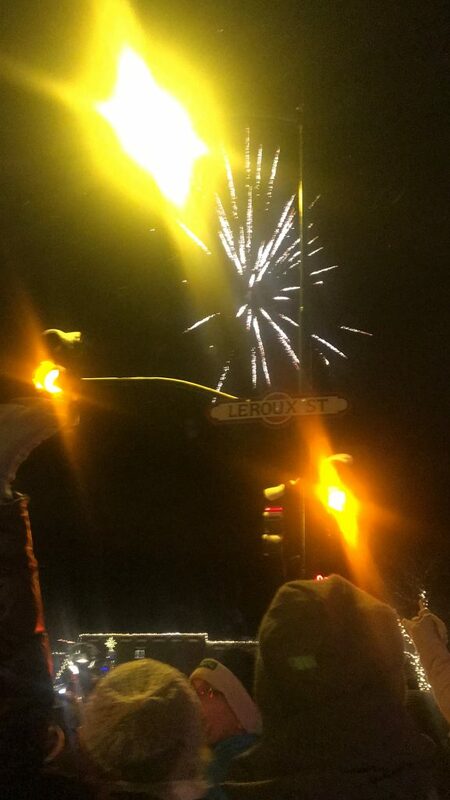 There was fun loud music being played right outside the hotel and fireworks!!! Some people even threw confetti around us. 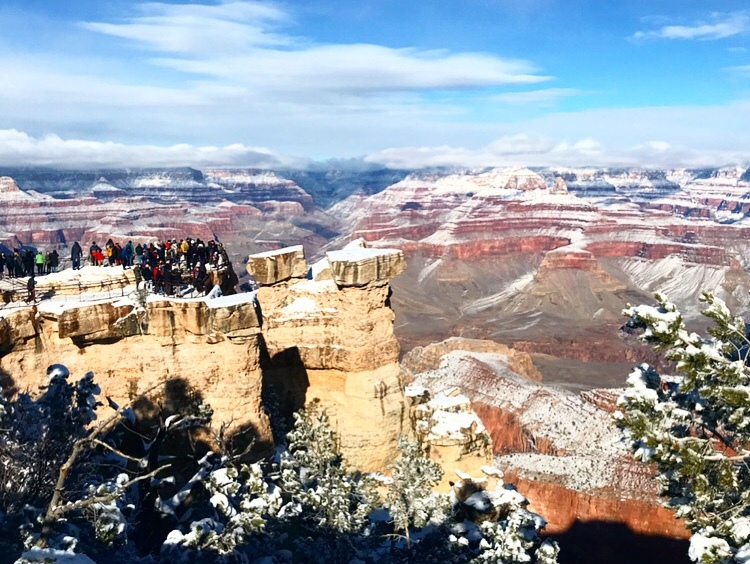 The following morning, on the 1st day of the New Year’s, my family and I wanted to show the Grand Canyon to Leslie, so we drove on over there. 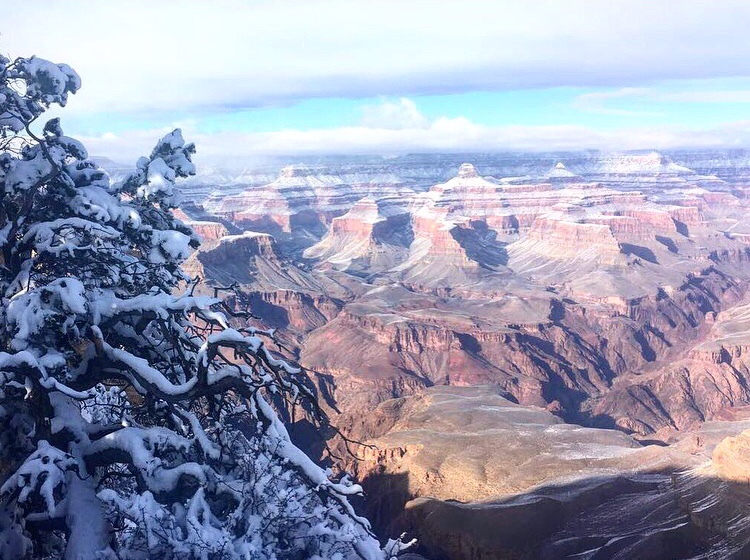 It was my third time visiting and what made this visit different this time was that I got to see the Grand Canyon in the snow. It was breathtaking. 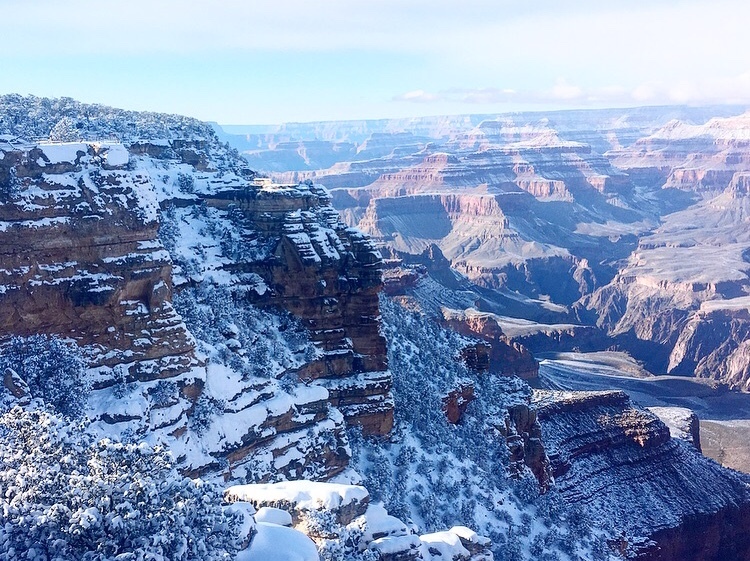 The snow on top of the layers of the Grand Canyon really added a touch to the nature. It was very cold and the walkways were full of snow and ice (it was also during the government shutdown). I managed to slip on the snow once and kind of hurt my knees before attempting to take a picture of my friend on her Polaroid camera… whoops. Thank you! 🙂 Yeah, it was a really hectic year with so much things that happened through the year – both good and bad. But thank you again and I really loved Rutgers! There’s no other college I would’ve enjoyed attending. I hope you have a great 2019 as well with lots of happiness, joy, and adventures. Congrats on graduating! Sounds like you had a great year.